Gas Guzzlers: Extreme's bread, meat, potatoes and a side order of awesome are all contained within the game's career mode, a beefy challenge that enables users to unlock new cars, new modes, new tracks and new weapons. So how does it shape up and is it fleshed out enough to be fun? Simple answer is yes. If you're satisfied knowing that the career mode works and you're not bothered to learn more about the content, you can bounce on right out of here and bother your time learning more about Foxconn sabotage conspiracies or the latest indie gem to make its way onto the PlayStation 4. However, if you're actually curious what's in the career mode of Gamepire's arcade-style combat racing sim, you can keep reading. Now just to get the air clear, Iceberg Interactive sent out review codes to anyone willing to spend time playing the game writing about it... I was one of those poor saps... although, I can't say the experience has been bad at all. In fact, I've had a ton of fun playing Gas Guzzlers: Extreme, and I was originally going to buy the first game but I lost track of it after it was greenlit on Steam and well... there were other pressing matters I had to attend to. After forcing a bit of my time into the game (because of the review code and all) I've been dabbling in the different modes, finding out what works, what works well and what doesn't So far, the multiplayer mode doesn't work but it's not because it doesn't work, it's because there's no one in there... like, ever. Career mode has been a lot more affording and amenable to fun. I've had a good fill of dabbling in various race types, customizing vehicles (though it's very limited) and blasting the crap out of the competition. The mode starts off pretty bare-bones, with a simple newb car in your garage that you eventually upgrade and win races with (if you're good). As you rank up and come in good positions in the races you'll eventually unlock new content with the money you earn, including new tracks, new paint jobs, new wheel rims, new weapons and even new sponsors that add an extra layer of depth and replayability to the game. Now the cool thing about the career mode in Gas Guzzlers: Extreme is that it's tiered; players will have to win races and rank up to new tiers before being able to access bigger, badder, faster cars and more dangerous weapons. You can only access a new tier by competing in a three-race tournament where you'll need to gather enough points to prove you're worthy of moving on up the food chain to face off against tougher foes on meaner tracks. In this regard, I absolutely adore the game's sense of discovery and content creep. It reminds me of the old-school classics when you played games and were surprised at unlocking something new... back during the times when paid-DLC didn't dictate the definition of “unlockable” content. 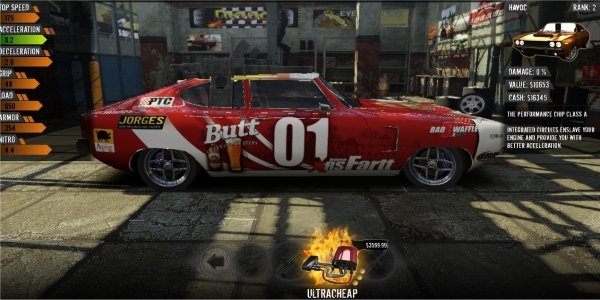 As previously mentioned, there are sponsors in the game and they can really add some extra flair to the racing experience. Completing races in good positions earns you extra money from your sponsor, and winning consecutively opens up special sponsorship events where you'll race on a team with other sponsored racers and you face off against a rival sponsor. The earnings are big if you manage to win but it's not always easy. There's a lot of close-calls and a serious measure of skill involved if you want to come out victorious. As you move up the ranks you'll unlock new sponsors, which may offer more money but under stricter conditions, as well as new game modes. Originally, the game starts off with Power Race and Battle Race, the first of which is just a normal bump-and-grind race without weapons, and the second of which is a race with weapons. You'll eventually participate in Knockout Races, which is basically a race until the last racer is standing. A Last Man Standing mode is also present, which is an arena based competition similar to the classic Twisted Metal. As you move through the career mode the modes will cycle through tracks you unlock as you progress and sometimes there are additional bonus conditions present that can help you earn additional cash so you can afford the destructive driving machine of your dreams. You can invest well over eight hours into the career mode of Gas Guzzlers: Extreme and still find that there's plenty to go back to and play. In a way, I kind of wish other games had progressive career modes with tons of unlockable content, sort of like wrestling games from the PSX and PS2 era. If I did have a gripe – and by all accounts, even I'll admit this is a petty gripe – it's that there's no multiplayer career mode options. But you know, if Gas Guzzlers: Extreme manages to find a proper audience and Gamepires can make a third game, maybe they'll make a multiplayer career mode an option. As it stands I think the mode definitely works and works well. For a budget priced title I was quite impressed with how the content continually trickles out in spurts as you play through the mode and I would be lying if I said I wasn't hit with the nostalgia stick. Definitely one of the few sticks worth getting hit by. 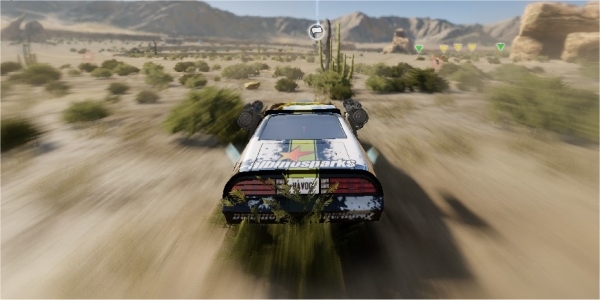 You can check out Gas Guzzlers: Extreme over on the official website. The game is also available on digital distribution outlets for only $24.99, which may or may not be within your budget for this kind of game.